Perhaps you are a seasoned professional, well trained and cut from the finest of warrior cloth. That’s a simple deduction since you are reading The Counter Terrorist. Your experience may have prepared you well to defend yourself, when the need arises. However, when you are overseas fighting for this country, or across town serving a warrant, who is watching over your loved ones? Who is protecting your daughter as she eats breakfast at an IHOP in Reno? Who is watching out for your son when he is in class at Virginia Tech? Who has your wife’s back as she makes a withdrawal from the ATM? The answer is probably “nobody” and the solution is simple: give your wife a Glock and a couple of loaded magazines and hope for the best. Sound ridiculous? This happens more often than you can imagine. There is nothing wrong with “hope” as long as it is part of the formula “Prepare for the worst, hope for the best.” Preparing your loved ones to win a potentially lethal encounter is the mission of the Front Sight Firearms Training Institute near Las Vegas, Nevada. Front Sight’s primary client is “mainstream America.” The staff at Front Sight consists of skilled professionals who teach with a calm, friendly demeanor. Students are taught to avoid a fight if at all possible. This is done by installing the Color Code of Mental Awareness system to aid in spotting the problem brewing in advance, and from a distance. With extra time come options. If the fight cannot be avoided, students are taught the most efficient methods to stop adversaries. Front Sight teaches stopping the fight that someone else started. The most popular course is defensive handgun, probably because a handgun fits into a purse or briefcase far better than an M4. 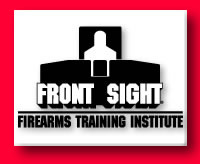 Front Sight’s flagship training is the 4-Day Defensive Handgun course because it is thorough, well designed, and lengthy enough to engrain the complex skills necessary for safe, accurate, and efficient shooting. On the first day of training, students discuss safety considerations and conduct dry practice. They start with fundamentals and incrementally add focus on each factor that supports sight alignment, sight picture, and trigger control during live fire. Students receive lectures on the color code, combat mindset, and other considerations. Live fire is conducted from three to seven yards where students hone their draw stroke, precision, and efficient trigger reset. Day two includes practicing tactical reloads, malfunctions (and immediate action), and live fire from three to fifteen yards. Then emergency reloads are practiced and failure-to-stop drills are introduced. Lectures on criminal and civil liabilities are discussed and verbal challenges are practiced. On day three students practice tactical movement: clearing corners, doors, and T-intersections. They experience a live-fire tactical simulator using gun handling, marksmanship, and tactical movement skills to clear a simple, single-story structure. Students practice repetitive live-fire drills (from a concealed holster), reloads, and malfunctions under time pressure. Day four involves live-fire drills for designated headshots and failure to stop. Students receive lecture, demonstration, and live-fire training for multiple adversaries. The day includes man-on-man competition; shooting steel targets in a head-to-head challenge to add some stress. The course is concluded with a skills test. This is a qualification course that tests all the gunhandling and marksmanship skills practiced over the previous four days. It is shot from concealment against the clock. Most students can identify a threat, present their weapon from a concealed holster, and deliver two hits to their opponent’s chest in 1.5 seconds or less. Students are encouraged to keep skills sharp with perfect dry practice at home and occasional live-fire training sessions at local ranges, and to return to Front Sight for more advanced training when desired. 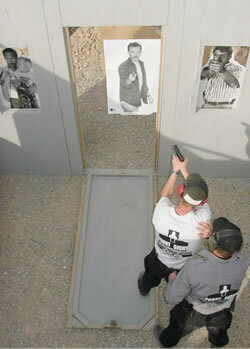 For young soldiers who want to be able to outshoot the guys in their fire team, police officers who wish to study a new weapon, and citizens who wish to exercise their second amendment rights and develop the skills necessary to defend themselves, Front Sight provides a great opportunity to attain shooting goals in a fun, low-stress environment.